I hope everyone had a wonderful Thanksgiving and a relaxing long weekend. That’s probably hard to hear for those living in other countries, but we’re all in the same boat now with the holiday crunch fully upon us. There was absolutely no way I was going to a mall this entire weekend, but I did manage to get a little online shopping done. Two of my four grandkids have December birthdays, making the month even more of a crunch. As for reading? What a mess! I didn’t finish a single book last week. Here’s wishing you MUCH better reading than me! Yes, I’m STILL listening to Michelle Obama’s memoir Becoming. Every one of the 16 hours I’ve listened to have been fabulous and with only three to go, I’ll finish this up in the next couple of days. 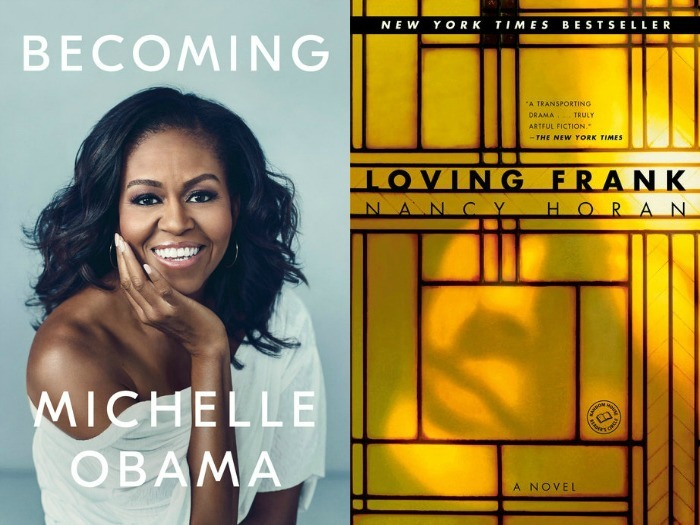 I’ve turned to backlist books that are also available for immediate downloads and picked up Loving Frank by Nancy Horan on Friday. It was a little slow going for me at the start, but now I’m over halfway through and am thoroughly enjoying this historical fiction. Mamah Borthwick, the woman who had a years long affair with Frank Lloyd Wright, and the scandal that surrounded it are at the heart of this 2007 novel. As I mentioned, right now I’m only looking at backlist books that I can get immediately on Libby. The three I mentioned last week, are newer releases, so I’m still waiting. 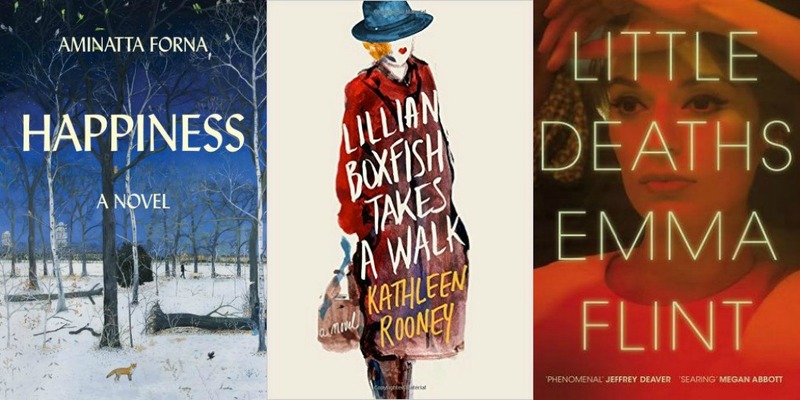 In the meantime, I’ve downloaded Happiness by Aminatta Forna (from earlier this year), Lillian Boxfish Takes a Walk by Kathleen Rooney and Little Deaths by Emma Flint (both from 2017). Any thoughts on which one I should go with next? I liked Lillian Boxfish! Quiet novel and very NYC. So sorry about Owen Meany. I really wanted to re-read that one too, but now I’m of course terrified and probably won’t do it! I wish you would reread it. I’d love to see if you had a similar reaction. Bummer on Owen Meany. I would be so sad to have me feelings change on that one. I’m throwing a lot of light reading into my mix right now — perfect for getting through the holiday season. I’m with you on avoiding the malls this past weekend! I’ll try some cyber Monday shopping today though. I’ve got Little Deaths on my tbr as well so I vote for that one! I did a bit of shopping tonight, also. I always feel so much happier once I get all that taken care of. Then I can enjoy the festivities! Sorry about the disappointment with Owen Meany. I read it and recall enjoying it but my favorite Irvings are Cider House Rules and Hotel New Hampshire. I think the first would stand up to a reread, not sure about the later. I finished Bad Blood over the weekend, which I thought was fabulous! I really liked Cider House, too. Bad Blood is one I’ve looked at a few times now. Lillian Boxfish was a delightful read. I hope to start Becoming soon…I can’t wait! I’ve had quite a few good comments about Lillian, so may head to NYC soon. I read A Prayer For Owen Meany in 2007 and didn’t like it at all. 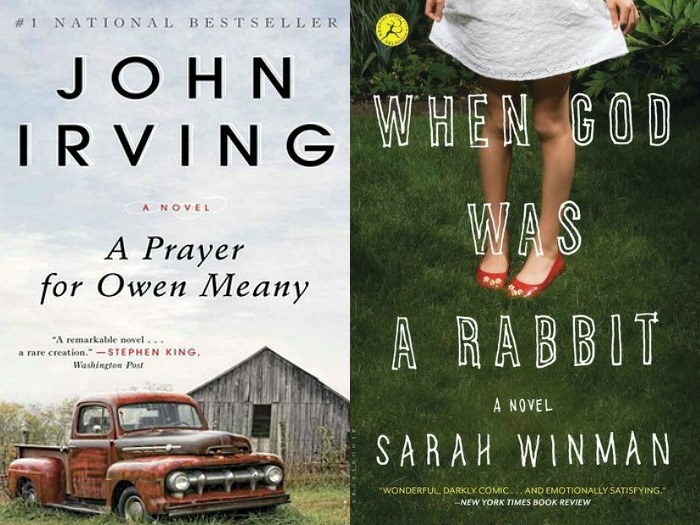 I just added When God Was A Rabbit after reading Catherine’s review. Hmm….now I’m super curious to see which side I fall on. We had houseguests and a lot of events over the holiday weekend so not much reading. I’m halfway through an ARC of The Mother-In-Law by Sally Hepworth. It’s light reading and is dragging a bit so I hope it picks up soon. Let me know what you think of When God Was A Rabbit. After reading Catherine’s review, I feel like I should have stayed with it, but felt like I gave it quite a bit. I usually enjoy re-reading. It seems I always discover something new. Come see my week here. Happy reading! My son has a December birthday, so I can certainly relate to the difficulty of doing Christmas and birthday shopping!! Happiness looks interesting. I’m going to go check it out. Happy reading, Susie! Thanks, Lindsey. Have a great week. I re-read Owen Meaney this year and had the opposite reaction. I thought it was “meh” when I read it in my 20s. Now in my 50s, the book really spoke to me. I still think about it. My other re-read was “Testament of Youth”, a WWI memoir, and I downgraded this one. I loved it when I was in my teens, but now I find it overlong, and some of her politics didn’t age well. Interesting how your opinions can change over time. That’s really interesting that you liked Owen Meany more the second time around. I really thought I would, too, but found it so slow. Thanks for visiting! We braved a couple stores on Saturday and it wasn’t nearly as bad as I thought it would be! But, I do enjoy online shopping. Hope you get some good reading in soon! I liked Owen Meany:) Hope to start the audio version of Becoming next weekend on a road trip. Hope you are enjoying that one Kathryn. I am a huge fan of Becoming. I’ll be sad when it’s over. Sorry about the DNFs, but it’s good you got some shopping done. I read Owen Meany in high school and liked it. That was a long time ago, though. I liked Tin Man, but I haven’t read the author’s other book. Have a great week! That sounds like an excellent weekend!